Through an annual trivia night organized by CCFR and the city officials, more than $125,000 has been raised over the past seven years to continue the program. 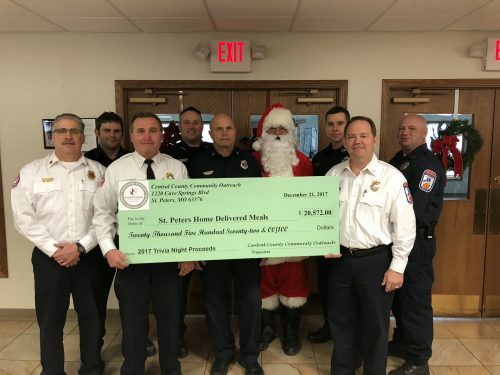 This year’s donation of $20,572 was presented to the senior center at its annual holiday party at 10:30 a.m. Thursday, Dec. 21 at the St. Peters Senior Center, 108 McMenamy Rd, St Peters, MO 63376. CCFR firefighters, city officials and local seniors were there for the presentation. Every week volunteers deliver more than 150 free meals per day, Monday through Friday, to homebound senior citizens and disabled residents in the community. In addition to organizing the trivia night, CCFR firefighters and city officials have also volunteered their time delivering meals. “Many times the meals on wheels volunteer is the only person the senior sees all day. The visit provides human contact and a safety net for these seniors,” CCFR Assistant Chief Gary Donovan says.